We hopped about quite a bit once we’d arrived in Canada from England via Turkey and Libya. We moved from Montreal to Toronto and finally to Niagara Falls where we first lived in a big old house close to downtown, before we moved to Cherrywood Acres. # 9.1 of the “On the Street Where I Lived” stories. It’s a close up view of one day in particular. It was only a few miles from our gloomy old house on Ryerson Crescent to our family’s new split level across town in Cherrywood Acres but it could just as easily have been light years away. It was a whole different world out there in the barely built development where the cherry orchards used to be, everything bright and shiny and newer than new. We moved to the new neighborhood in the middle of fifth grade, in the middle of winter. 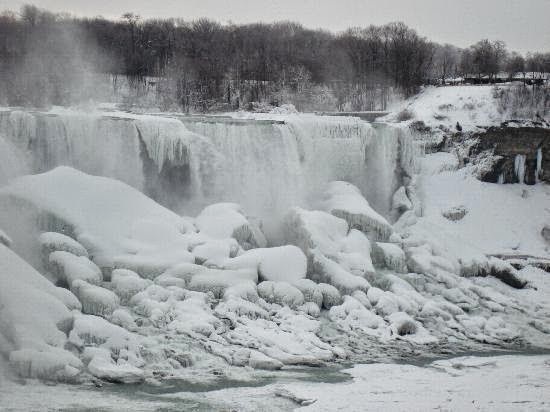 I hated Niagara Falls in the winter, when sometimes it got so cold that the falls actually froze, the water turned into ice sculptures as it churned over the bank of the Niagara River. The cold, the snow, the ice and the hockey, I hated it all. But there was no escape. None of us three kids wanted to move away from our friends even if the new house was pretty and filled with light but our mother wanted that modern split level with the attached garage so badly she wasn’t going to let our whining ruin things. Instead she took us shopping for winter boots to wear on our first day at the new school. Like we were supposed to think it was some big treat. As if we’d be so thrilled to wear new galoshes that we’d completely forget how mad we were to leave our old school and all our friends behind. My brother wasn’t going to waste any part of a Saturday on shopping so it was just my mother, my sister and me. Standing in the classroom cloakroom that first morning in February I saw that the shopping trip had been a big mistake. The saleslady at the shoe store had convinced our mother that white galoshes were adorable, so much less clumsy looking than the ungainly black rubber galoshes all the boys wore. Without our annoying older brother around to make fun of them, I’d gone ahead and let her buy the boots. ‘All the girls will be wearing them.’ Would they? Would life in the shiny new tract be that different? Everyone I knew wore black or brown galoshes, everyone in the world wore them; all the kids at Simcoe Street Elementary School did, not just the boys, the girls too, clomping down the stairs, buckles unclipped, whack, whack, whacking loudly together. Black galoshes just like the ones I saw now in the cloakroom of my new classroom, lined up sloppily underneath the parkas and scarves hanging on the cloakroom hooks. Not another pair of white snow boots in sight. The worst of it was that I secretly loved the white galoshes, they were adorable and I liked how they looked with my light blue parka. But I knew the boots marked me as girly and girly was dumb especially at a time when we were all acting like nothing was changing. Kids my age made believe that we were still the same old boys and girls as always; having snow ball fights in the winter, putting pennies on the tracks for trains to squash into thin coppery disks come the longer springtime afternoons, running practically naked and carefree under the sprinklers on humid summer days, and breaking into teams to pelt each other with piles of autumn leaves. But the times, they were a’changing. There wasn’t an available empty desk in the classroom so the teacher told me to hang my things in the cloakroom while the custodian brought in another desk. I pulled off my telltale white boots and and draped my scarf over them, as if the scarf accidentally slid off the cloakroom hook. Since recess was coming soon I decided to leave on the snow pants I wore under my dress. I hung up my parka and slipped back into the classroom, trying to be quiet so no one would notice. No such luck, my snow pants swooshed noisily and half the class turned around. The desk hadn't been brought in yet so I waited against the back wall and looked over the mysterious sea of heads. Girls with pony tails, curls and ribbons, braids. Boys with soft looking brush cuts, some with trails combed through their dark, wet hair, the backs of their necks pale beneath the collar of button down striped shirts and wool sweaters. Occasionally one of the kids shifted in their seat trying to sneak a look. When the door finally opened and the custodian brought in the desk, the entire class turned completely around in their desks and stared shamelessly. Like I was a new guinea pig they were going to keep in a cage on the science table at the back of the class, taking turns visiting and feeding at recess and lunch. “Thank you Mr. Agosta, if you could put it right there behind Walter please. Second row from the window.” She pointed to the end of the row, four kids in all. I watched with the whole class as Mr. Agosta carried the desk across the room, heard the scraping when he set the desk down on the floor behind Walter. “Walter! Apologize this instant.” I wished Miss Allen hadn’t done that. Walter, brown hair, freckles, tortoise-shell framed glasses, not exactly movie star material himself, half-turned in his seat. “Sorry.” The word shot out of the corner of his mouth like a secret spitball. Miss Allen gestured for me to come up to her desk while the rest of the class got busy with their math books. She told me not to worry about Walter. Handing me a page of math problems, she asked me to give them a try so she could see if I was as far along as the rest of the class. The good news was that since we used the same SRA system back at Simcoe Street as her class did, I didn't have to take a reading test! I would still be in my same group, the second highest in the class. I’d always loved walking to the back of the classroom to the big SRA box and flipping through the color-coded cards, like I was a secretary or a librarian. I always wanted to be a librarian. In fact, I secretly still played ‘librarian’ with my sister; we made Date Due slips out of my parents’ bridge game score pad and taped them inside our mother’s books. We didn’t own that many, mostly just some old Readers Digest adaptions, but she read all the time, taking hoards of books of out the library. I guess that’s where we got the idea. Nancy stamped the ‘date due’ with an old date stamp and ink pad of our dads. She insisted on pressing it down hard into the ink pad, getting black ink all over her hands. Being too old to play I simply pretended to check out the books, putting them in a pile and carrying the pile from the bedroom to the living room where I watched TV for a couple of minutes or got a snack and then back to the bedroom to return the books. As the older sister I naturally supervised and corrected Nancy when she messed up and stamped the date crooked. Or, worse, stamped one of the dozen or so actual library books our mum had lying around the house. In reality I was glad she and I were still going to be sharing a room in the new house; my mother let me pick out the drapes, a ballerina print taken from Degas. When the recess bell rang, I was still working on the math problems. Frantic to finish and prove I was on track with the rest of the class, I kept my head down while the other students got their boots and coats on and went outside. A few minutes later Miss Allen noticed. “Is it alright if I finish it now?” I really didn't want to be in the lowest math group. I put on my parka slowly, pulled on my stupid white galoshes and left the classroom. Way down at the end of the hallway, long, shiny, and hollow sounding, I could see two bright light spots, windows in the double doors leading outside. But outside those doors, there was nothing but white. No other kids. Nothing. I stood on the icy pavement under the awning, leaned against the pole and looked around. Miss Allen was wrong, it was snowing. There was nothing to see, no playground swings, no tetherball pole, just a white sky and a snow-covered field that went on forever. Nothing but snow. Far away there was a wall, a snow-coveredwall ; beyond that I could see naked trees swathed in snow and the snow-white topped roofs of houses but nowhere a boy or girl in sight. Where was everybody? I knew they must have their special playing places when they had to play outside in the cold; behind a wall somewhere, in back of the ball room, sheltering under a tree. Looking to my right and left, I could see the corners of the building, blurring in the snowfall, seemingly thousands of miles away. On my right was the teachers’ parking lot. On the left, the white of the playground field disappeared behind the corner. Maybe the other kids were around the corner on that side of the school, making angels in the snow or Eskimo pies. I could try and find them but it was so cold, so cold and snowy. Besides I didn’t know their recipe or who the head chef was. What if I got there and there was no room in the kitchen? Instead I stayed by the door. It was way too cold and snowy, a blizzard practically, I convinced myself, to go wandering around in. I thought of Joanne back at my old school and how we used to stay inside for recess on cold snowy days and clean the blackboard. She was probably doing that right now with some other girl, toasty and warm, drawing chalk hearts on the board. I stayed like that for the entire recess, arm wrapped around the pole as the snow started to come flying down even faster, the high awning doing nothing to keep the flakes from finding my face and freezing my nose and cheeks off. Feeling sorry for myself, I stood there frozen to that pole, unable or perhaps unwilling to move, trapped in the wintry wilds as if I hadn’t a friend in the world, alone, abandoned, brushing snot and snow and a few pathetic tears away with my mittens until the bell rang. I’d never felt more miserable in my life. How could I know that what my mother said was true? It is always darkest before the dawn. After recess as I trudged down the hallway back to class, a door opened and a girl I remembered from class stuck her head out. She wore a stretchy black hairband. From the chatter behind the door came a voice I recognized. She was a good three to four inches taller than me and she had one twinkly dimple in her left cheek. I felt defensive. Was she going to make fun of my name now? Call me Simonize Wax? Tell me how bad I must be with a name like Good? I was Good. She was Meanley. I smiled my suckface smile all the way to the cloakroom and back. Trixie and I would spend the next few winters—springs, summers, and falls—together, best friends who weathered the storms of puberty together. We went from climbing cherry trees and rambling through the neighborhood to combing through teen magazines and sobbing over the Beatles. We went from wearing snow pants under our dresses to mini skirts, boots and too much mascara. We stayed the best of friends until I moved away at the beginning of our freshman year in high school. I remember I was devastated that I had to go. Bereft. As if I was losing my best friend. Which I was. Life can be funny like that though, just when we're content and comfortable in our skins, something happens—an external like your father getting a new job—or internal—like you've simply grown out of your own skin. That's when change happens. Time to move on. Like it or not.